Have you ever noticed Ruby doesn’t include support for linked lists? Most computer science textbooks are filled with algorithms, examples and exercises based on linked lists: inserting or removing elements, sorting lists, reversing lists, etc. Strangely, however, there is no linked list object in Ruby. Recently after studying Haskell and Lisp for a couple of months, I returned to Ruby and tried to use some of the functional programming ideas I had learned about. But how do I create a list in Ruby? How do I add or remove an element from a list in Ruby? Ruby contains fast, internal C implementations of the Array and Hash classes, and in the standard library you can find Ruby code implementing the Set, Matrix, and Vector classes among many other things. But no linked lists – why? 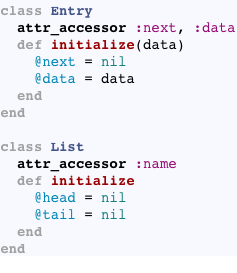 The answer is simple: Matz included features you would normally associate with linked lists in the Ruby Array class. For example, you can use Array#push and Array#unshift to add an element to an array, or Array#pop and Array#shift to remove an element from an array. Today I’m going to look at a few common operations you would normally use a linked list for, and then take a look at how you would implement them using an array. We’ll also get some insight into how Ruby’s array object works internally. When I think of linked lists, I think of the Lisp programming language, short for “List Processor.” In his classic article, Recursive Functions of Symbolic Expressions and Their Computation by Machine, Part I, Lisp inventor John McCarthy defined the “cons cell” as the basic building block of linked lists, and a corresponding “(cons …)” Lisp function to create these cons cells. Superficially, it appears that the unshift method on the Array class is equivalent to the cons function in Lisp. Both of them add a new element to the beginning or head of a list. However, arrays and lists are very different things. 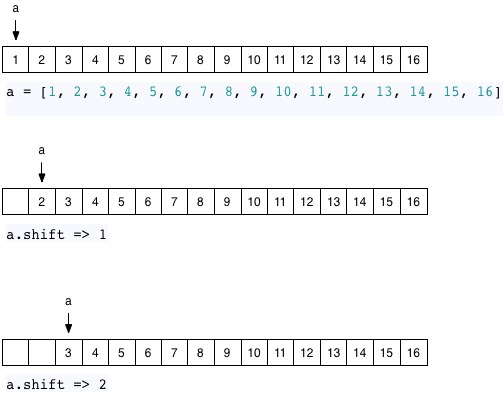 Arrays are designed for random access of data across a large set, while linked lists instead work well inserting, removing or reordering elements. Adding new elements to the middle of a list works largely the same way as adding a new element to the head of the list. If you call the Array#insert method, Ruby first needs to move the remaining elements to the right to make space for the new value. The size indicates the actual size of the array. As I repeatedly called unshift in my example above, the size of the array increased from 1 to 2 to 3. When Ruby creates an array internally it allocates some extra memory since you are likely to add more elements to the array soon. Whenever you create a new array object, Ruby initially sets the capacity to 3; this means that it can save three values into the array without having to ask for more space. Once you add a fourth element, however, Ruby has to stop and get some new memory from the garbage collection system before saving the fourth value. This might trigger a GC operation if no memory is available. As you add more and more elements, Ruby repeatedly increases the size of the array’s capacity in chunks whenever you cross certain array sizes: 3, 20, 37, 56, 85 elements, etc. The exact thresholds are determined by the ary_double_capa C function inside of array.c. More or less the array capacity increases by 50% each time, although the first increase, from 3 to 20, is a special case. You pay an extra performance penalty each time this happens. Whenever you remove an element from an array, using shift or pop for example, Ruby may also reduce the capacity of the array along with the size. This means it might stop and free unused memory from the array back to the GC system, causing an additional delay. 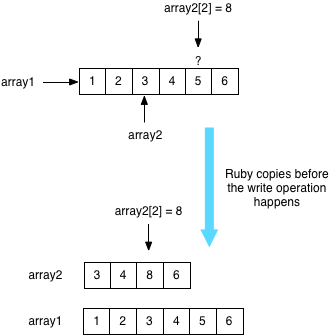 So far, we’ve seen that Ruby arrays can function as linked lists. Ruby provides the push, unshift and insert methods to add a new element to a list, and the pop or shift methods to remove an element from a list. Not only that, with an array you also get direct, random access to all of the elements of the array, which a pure linked list structure can’t offer. The only downside with using an array as a linked list seems to be performance: if you had many 1000s of elements Ruby would theoretically slow down repeatedly resizing the array to accommodate all of the elements as you added them. Also, if you needed to add or remove elements to the head of the list or somewhere in the middle, then Ruby would also slow down shifting the remaining elements to the right or left. But remember, since Ruby is implemented with C internally, it is able to use very efficient C functions to move the elements around. Memmove and similar low level C functions are often implemented directly by the microprocessor hardware and work very, very quickly. However, there’s another important feature of linked lists which isn’t immediately apparent: they work nicely as functional data structures. What does this mean? In functional programming language such as Lisp, you specify your program as a series of “pure functions;” these are bits of code that always return the same output given the same input. Functional programming languages also discourage the use of “mutable values” – variables or objects that can change from one value to another in place. The primary benefit of using pure functions and immutable values is to allow your software to run more reliably and robustly since your code will have no side effects. Functional languages also work well in multithreaded environments since there’s no need to synchronize or lock code that modifies data – you just don’t modify data at all. Data structures that exclusively use immutable values are known as “functional data structures.” Aside from the large benefits of robustness and removing the need to synchronize access different threads, functional data structures also allow for data to be easily shared. Since you never modify data in place, it’s easy for many different functional data structures to use the same copy of data internally. Now I have two linked lists, which share the same cons cells for 2 and 3. As long as you never actually change one of the elements in place, it’s no problem at all for the elements of different linked lists to be shared! Functional data structures allow you – or language implementors at least – to apply optimizations to share and save memory. As a matter of fact, it turns out that Ruby does exactly that! Using a series of tricks known as “copy on write optimization,” Ruby shares values across different arrays! Ruby does this by maintaining a single copy of the larger array with all the data values, and creating the second array using a simple pointer or reference to the middle of larger array as shown above. This is called a “copy on write” optimization because Ruby has to break down the sharing and copy the data elements over when you change or write to one of the values in the shared array. Practically speaking, you don’t need to worry about this: Ruby will automatically handle everything for you internally, saving you the memory when it can, and paying the price to copy around the data when it must. As I explained above, theoretically Ruby needs to shift or copy all of the existing elements over to the left whenever you remove an element from the head of a list. For a small array like this one that won’t matter. But if the array contained 1000s of elements, it’s possible this could be a slow operation. Why did I bother to draw an array with 16 elements in these diagrams? It turns out that when you call shift Ruby doesn’t use this optimization until there are at least 16 elements. If you shift a value off of an array with 15 or fewer elements, then Ruby will just move all the elements to the left, since memmove is so fast with a small array. To wrap things up today, let’s take a look at how you would actually implement a linked list in Ruby. As we’ve seen, arrays can often serve quite well as lists. Sometimes, however, you may actually need to repeatedly insert, remove and reorder elements in a large list. To avoid the performance penalties associated with array resizing and shifting, a real linked list might be what you need. See this interesting 2012 article for more details on this approach. The author also shows some benchmarks comparing arrays and lists. Finally, if you’re interested in learning more about functional data structures and trying them out in Ruby, see Simon Harris’s Hamster library of immutable data structures implemented in Ruby. Simon also wrote this excellent article in 2010 about how functional programming has caused him to rethink how he writes OO classes: Functional programming in object oriented languages.